This is the latest version with all new full 320 degree rotating turret! The Taigen BB tanks are of the highest quality and are brand new to the market. What differentiates them from other RC tanks is the high level of detail and the strong metal components. Taigen tanks are available in different configurations but the ones we sell are the highest configuration with every possible option and upgrade included. 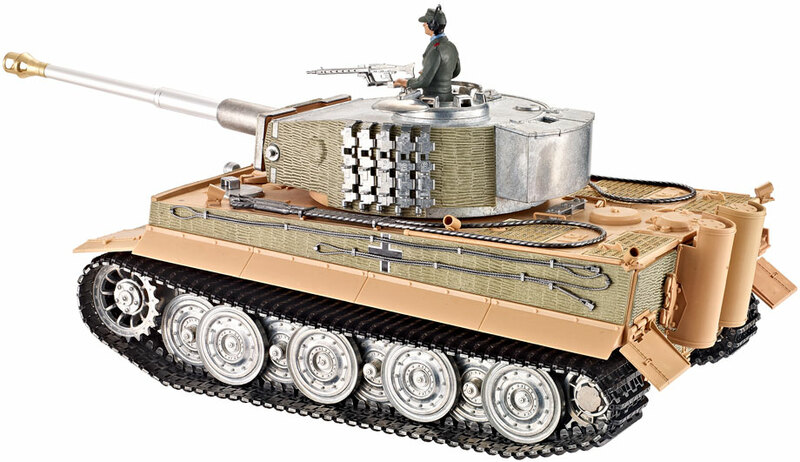 This is a new upgraded version of the full metal late version of German RC tank -Tiger I. The Taigen RC tanks are of the highest quality and are brand new to the market. What sets them apart from other tanks is the high level of detail and the strong metal components like gearbox, drive wheels, turret, barel and many more. The next great thing apart from its looks is the brand new radio equipment. This deadly machine comes with 2.4GHz transmitter receiver kit featuring many improvements compared to the old crystal based systems like extended range, no interference from fellow enthusiasts and precision steering. From now on you can have epic battles with as many radio controlled tanks as you wish. The next very cool feature is the sound on this machine, the sound generator has 2 channels and can play 2 sounds simultaneously - in short you will hear the gun firing over the soundtrack of the engine adding to the authenticity of the model.Taigen tanks are available in different configurations but the ones we sell are the highest configuration with every possible option and upgrade included. This beautifully made Tiger tank comes in a desert type brown camouflage finish and looks amazing. The attention to detail is stunning and not only is this a fully working model with sound effects, smoke and the ability to fire BBs, but it is sufficiently detailed to be used purely for display. 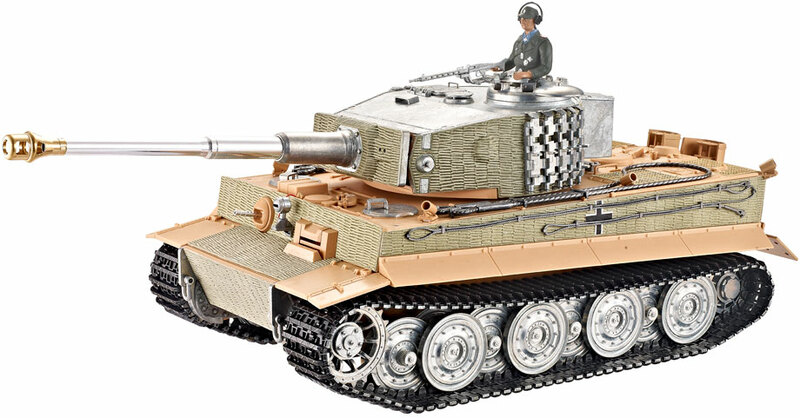 Many of the components and features of this tank are made of metal, giving durability and a more realistic feel and appearance to your model. We think the pictures speak for themselves! The pull ropes are made from real metal cable and have been carefully coloured to give a feel of authenticity. The caterpillar tracks are scaled down versions of what you would get on the real thing, fully metallic linkages that will form to the terrain and any obstacles in the tank's path. When you pick this tank up, everything about it says quality, for a start this is a faiirly hefty model, it feels robust, it feels right, you could say it's built like a tank! So why not treat yourself to a piece of military history that's not only great to look at, but will give hours of fun as it growls and smokes its way around your garden or park, and where safe to do so can fire BBs at the target (included in the box) with a realistic recoiling action. RC tanks don't really come better than this! The Tiger comes complete with a hand-painted camo design. Below are some images showing the plastic and metal components of the tank before it is painted. Hello - Thank you for your question. Unfortunately currently we do not have a specific date as to when we will have this item in stock again. However if you go to the items web page on our website, you will be able to sign up to get notified when the item is back in stock. I hope this helps. Hi, Thank you for your question. The hull length is around 45cm The tank is suitable to be used in off road terrain. 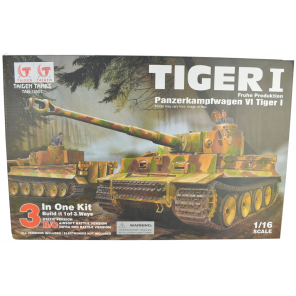 I have just bought the latest full metal upgrade Tiger 1 camo - does it have the recoil barrel feature as the airsoft version ? Hi, Thank you for your question. The tank it'self will recoil but not the gun barrel. do the hatches in front of and on the turret open? Thank you for your question. The hatch on the top of the turret opens to put the figurine inside as well as the rectangular hatch which also opens. There is also 2 hatches at the front of the turret which also open up. What a tank! It has everything great paint work, great sound card, recoil barrel & hull on a BB firing tank, steel gears, that's an extra £50! Put it in a wooden box call it a Torro Tank and charge another £150. Thanks Nitrotek what a scoop you have with this tank. One more tank to my collection again a well built heavy tank Again very happy with the tank even my cat Mr Himmler likes it well done Nitro Tek. This replica of the Tiger is beautiful, it was delivered pretty fast to The Netherlands. The price is excellent for what you receive, a high end with high detailed model. Tank arrived in 2 working days as stated. This tank is beautiful, its sounds looks manoeuvres like the real thing, and the quality is 1st class, its heavy given most of it is metal parts, the tracks & suspension wheels are incredibly detailed and well made. Its difficult to keep in mind that when starting up the engine is actually a small speaker and not a v12 diesel unit, so realistic. This is my first introduction to rc models, I'm 57 yrs old and as excited by this tank as was when I got my model cars at 7yrs old. Thanks to Nitrotek, still trying to decide on my next purchase.